Founded in 1947, University of Maryland University College (UMUC) is one of 11 accredited, degree-granting institutions in the University System of Maryland (USM). As a globally-focused university, UMUC serves more than 90,000 students worldwide. 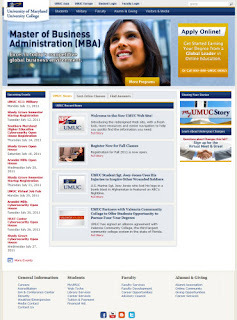 Offering a broad range of cutting-edge classes, UMUC has earned a worldwide reputation for excellence as a comprehensive virtual university and for focusing on the unique educational and professional development needs of adult students. The UMUC Web site required the implementation of a robust content management environment that is easily accessible and simple to learn for front-line staff and other content contributors with no HTML knowledge. The environment had to also be well-suited for the UMUC Web team design/development staff and allow for straightforward creation/updating of Web elements. Additionally, the system needed to provide a content review and approval workflow to allow the UMUC Web team writing/editing staff to easily review content submissions from contributors. Fig Leaf hosted technical sessions with the UMUC stakeholders to understand the new vision for the redesigned public site. It was identified that the most critical function of the UMUC public Web site is to serve as a recruiting tool for prospective students. The main area of the site was designed to be heavily oriented towards sales/marketing and utilize attention-grabbing imagery and banners. The focus of the new site is to provide information regarding academic programs and requirements, financial aid, transfer credit, and UMUC 411 (a virtual classroom test-drive). Special emphasis is placed on improving the navigation and search of UMUC’s academic programs. Access to other functions for the general public (i.e. media relations, employment, etc.) is also located on the www.umuc.edu home page as these audiences will not have other “portals” to visit to locate the content they need. Home page access to popular social networks such as Facebook, Twitter, YouTube, LinkedIn, etc. is included as well. Following the design review, Fig Leaf Software implemented the CommonSpot CMS, including the development of custom elements and render handlers necessary to complete the data and business requirements, functional requirements an operational requirements for UMUC. Fig Leaf Software set up the site to work with UMUC's WebTrends server. UMUC is a state institution and must meet section 508 compliance standards so Fig Leaf Software set up the new Web site to be as accessible for users with disabilities by ensuring accessibility to Web page graphics by the visually impaired using assistive technology such as screen readers. This has been accomplished by using text labels and descriptors for graphics and form fields which is a feature of CommonSpot’s built-in accessibility features (such as requiring the entry of alt tag text when an image is added to a page). Fig Leaf Software also set up the UMUC taxonomy so users can easily browse and discover topic information within topic areas based on one or more selected facets within UMUC's defined taxonomy. Fig Leaf Software also integrated the Google Maps API to allow users to zoom in and out and click and drag maps. Each UMUC location is clickable and opens a pop-up window with the location title, address, a link to its individual Google directions map page, and a link to a page with more location details. Information about each location is also listed in full below the map to provide a text alternative to users with disabilities. The new site also includes a robust calendar and fully integrated lead generation web forms. The UMUC marketing advertising team launches between 5-15 new lead generating Web forms weekly. Each of these Web forms are developed by the Marketing Web team from various templates that have been approved by the Marketing Advertising team. Each template corresponds to a specific campaign. All of the data from the lead generating Web forms are then imported into UMUC’s CRM system. Prior to launch, Fig Leaf Software provided end-user orientation and CommonSpot training so that the non-technical end users would have the skills and abilities to migrate roughly 5,000 pages of content to the new site prior to launch.